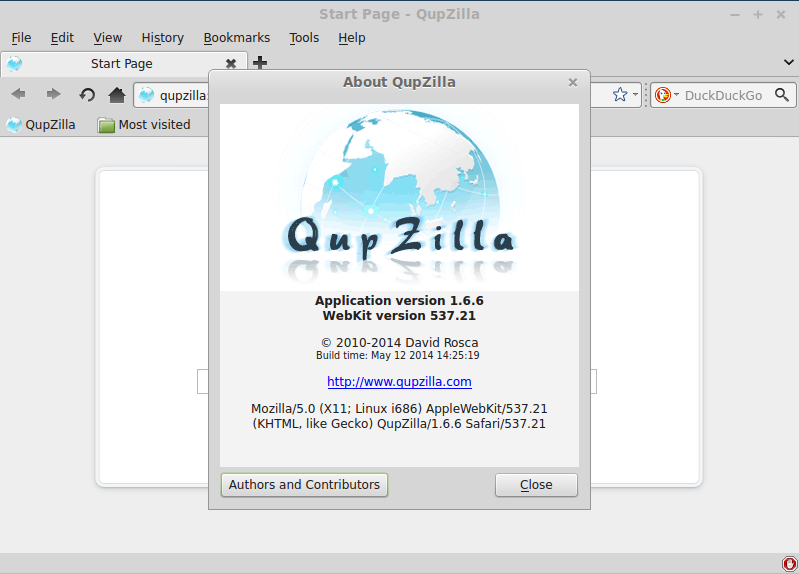 The latest version available is Qupzilla 1.6.6, which has been released a while ago. Among others, it got an AutoScroll plugin, a Web Inspector accessible by pressing F12, enabling the users to analyze the visited webpages, got a better integration with the desktop environments, got support for creating customized keyboard shortcuts, proxy manangement and password manager. In this article I will show you how to install QupZilla 1.6.6 on Ubuntu 14.04 Trusty Tahr, Ubuntu 13.10 Saucy Salamander, Ubuntu 12.04 Precise Pangolin, Linux Mint 17 Qiana, Linux Mint 16 Petra, Linux Mint 13 Maya, Pinguy OS 14.04, Pinguy OS 12.04, Elementary OS 0.3 Isis, Elementary OS 0.2, LXLE 14.04, Debian Jessie, Debian Wheezy, Kwheezy, Crunchbang, OpenSUSE 13.1 and OpenSUSE 12.3. To install QupZilla 1.6.6 on Debian, Kwheezy and Crunchbang, we have to download the deb packages from the official site and install them with dpkg. Follow the instructions for your architecture exactly, in order to get a successful installation. QupZilla 1.6.6 is available via repository, for the latest OpenSUSE systems. Follow the instructions for your system exactly, in order to get a successful installation.